Sylacauga, AL - Funeral service for John Basinger Jr., 93, will be Thursday, August 23, 2018 at 2:00 p.m. at Radney-Smith Chapel with Rev. Max Buttram officiating. Burial will be in Evergreen Cemetery in Sylacauga, AL. Mr. Basinger died Monday, August 20, 2018 at Grandview Medical Center. He was preceded in death by his wife, Marie (Tootsie) Basinger, son, Mike Basinger, and daughter, Sandy Mayfield. 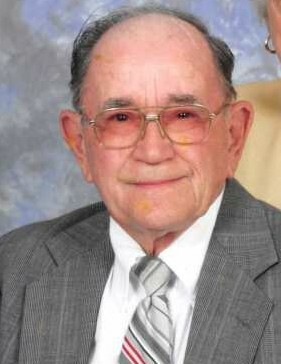 Mr. Basinger was a devoted Christian who loved his family. He continued to server Jesus until his death. He is survived by his three grandsons, Scott (Sheila) Mayfield of Rockhill, SC, Chris (Bethany) Basinger of Sylacauga, Chad (Misty) Basinger of Sylacauga; granddaughter, Lynn Barnett of Sylacauga; daughter-n-law, Renee Basinger of Sylacauga; seven great-grandchildren, Blair (Sydney) Mayfield, Trent (Ashley) Barnett, Kirstie Barnett, Jordyn Basinger, Hayden Basinger, Riley Basinger and Logan Basinger all of Sylacauga. Visitation will be Thursday August 23, 2018 from 12:00 p.m. until 2:00 p.m. at Radney-Smith Funeral Home. Pallbearers will be the Deacons at Calvary Heights Baptist Church.